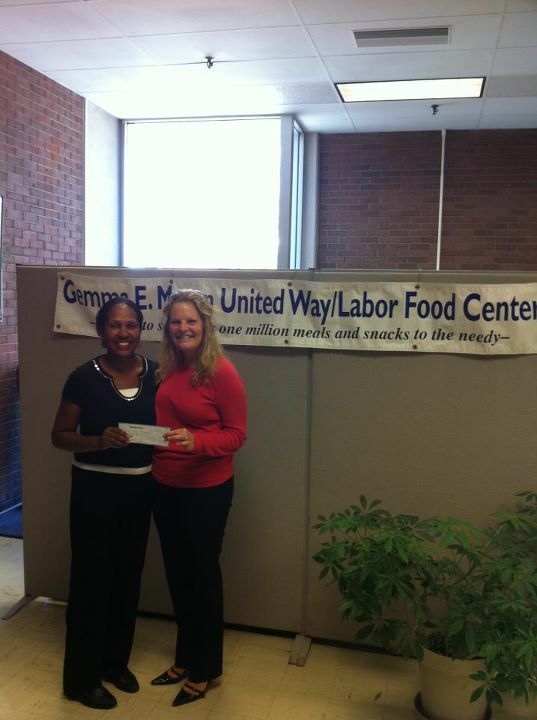 Delivering (Victoria Mueller) our fundraising win from Night Out New London to Kathy Sebastian, Director at Gemma Moran. Handing over $500 never felt so good! 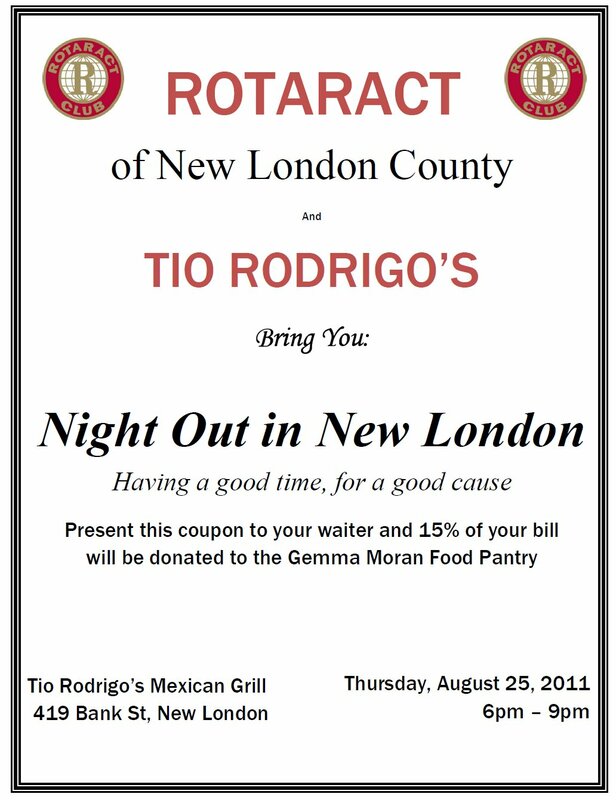 New London Rotaract is a service oriented group for young professionals in Southeastern Connecticut, ages 18-30, who are dedicated to developing knowledge and understanding of the needs, problems, and opportunities in our community and worldwide.? In our first year, we have planted bulbs in a New London park, helped with Covenant Shelter car washes and their Homeless to Hopeful event, participated in Tommy Toy Fund, and raised money to adopt a village in Kolar, India through the South Asia Pure Water Initiative. We have many exciting projects in the upcoming year as well. Please feel free to join us! This February, we have invited Dawn Crayco, Deputy Director of End Hunger CT to be our guest speaker. She will give us an overview of food security and scarcity in Connecticut. We're one of the wealthiest states in the country but even CT residents have problems putting food on the table. Did you know that 73% of kids in New London are eligible for free or reduced price lunch? A percentage that is higher than New Haven, New Britain and Norwich. As Rotaractors, we are primed to make a difference in our community but we have to know where the need is. End Hunger CT will help us paint that picture. U.S. Rotaractors visit the Rotaract Club of Pisco, Peru, to help with service projects in the earthquake-devastated city. Journey to Pisco EN from Rotary International on Vimeo. How does Rotaract fit into the Rotary family? opportunity for professional development. Organizing a Rotaract club is one of the most rewarding activities a Rotary club can undertake in its community. The Rotaract program gives Rotarians the opportunity to mentor dynamic young women and men interested in providing service to their own communities as well as the global community. In turn, a Rotaract club can bring new energy to a Rotary club, inspire fresh ideas for service, increase support for projects, and help develop future Rotary club members. Rotaract clubs are self-governed and largely selffinanced at the local level. Working in cooperation with their sponsoring Rotary clubs as partners in service, Rotaractors are an important part of Rotary’s extended family. What does a Rotaract club do? experience and opportunities for the personal development of each Rotaractor. Sponsoring Rotarians can enhance the professional development of Rotaractors by providing practical advice on entering the business world and tackling business, vocational, and professional challenges. Making the club’s professional development projects into joint Rotaract-Rotary projects can also help Rotaractors get better acquainted with sponsoring Rotarians. most critical issues, such as violence, drug abuse, AIDS, hunger, the environment, and illiteracy. Each Rotaract club is required to complete at least two major service projects annually, one to serve the community and the other to promote international understanding. Each should involve all or most of the members of the club. Photo courtesy of Alexis Tugume. A Ugandan Rotarian salvaged several dozen pairs of sturdy work gloves from a 2010 Rotaract project and is using them to raise money for starving children in his home country. The gloves were issued to Rotaractors in June as they took part in a neighborhood cleanup project during the Rotaract Preconvention Meeting in Montreal. Alexis Tugume with the gloves he collected in Montreal. More than 50 Rotaractors helped clean up Parc Jeanne-Mance, just blocks from the hotel where they were staying. As the volunteers prepared to dispose of their workgloves, an idea struck Alexis Tugume, who was then a member of the Rotaract Club of Kampala Ssese Islands. "I gathered up all the dirty gloves we were using for the cleanup exercise and brought them to Uganda," says Tugume, now a member of the Rotary Club of Kampala-Ssese Islands. "The idea was to find a way to use those gloves to fundraise here in Uganda and feed a couple of hungry children." Other Rotaractors who took part in the park project wrote a letter to help Tugume get the gloves through customs on his trip home. After washing the gloves, he rented them out for 50 cents a pair to volunteers constructing classrooms for a school in the Ssese Islands. The initiative raised US$20, enough to feed a Ugandan child for about one month. Tugume's Rotaract club used the funds to help a local child suffering from severe malnutrition. Tugume plans another glove rental in March, when Rotaractors from his former club are slated to start building a student dormitory. His aim is to continue renting the gloves for as long as they last. Tugume's ingenuity impressed other participants in the Montreal park cleanup. "Our almost-waste has become the source of several projects in Uganda," says Andrea Tirone, a Rotaractor from Toronto and a former Ambassadorial Scholar. "It just goes to show you the power of Rotary and the interconnectedness between us. Great things come about as a result of like-minded youth coming together in service." Content Copyright © 2005-2019 Rotary Club of New London, Connecticut USA.